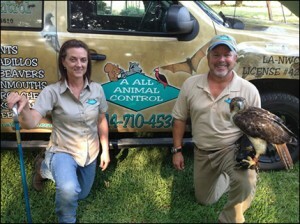 Rockwalls’s most gentle and complete wildlife service! A All Animal Control of Rockwall will handle all of your animal removal needs. We are certified wildlife professionals and can safely remove pest wildlife from your home or business. We will get rid of bats in your attic, raccoons in the crawlspace, birds in the vents, moles in your yard and more. We have the tools to trap animals and remove them humanely. Animal trapping is often the best way to control wildlife. Animal trapping will get the animal out of your home. We can then find where the animal is getting in and seal up your home so they can’t get back in. Animal exclusion will prevent animals from getting into your home. Raccoons in the attic, rats in the walls, snakes in the house are just some of our specialties. When raccoons start taking up shelter in your home, crawl space, under your porch, or even under your shed, you need raccoon control immediately. Call A All Animal Control for help! Raccoons are generally on the hunt for food, shelter, or a place to have and raise their young. Rockwall is a great place for raccoons. They will take shelter anywhere that they feel safe. Attics and crawlspaces are perfect for raccoons because they are warm and enclosed areas. The professionals at A All Animal Control will seal up entry points, complete repairs from damage the raccoon may have caused, and clean-up and sanitize the area. Droppings from the raccoons will add up quickly if they are not taken care of immediately. Let us take care of raccoon trapping for you. Squirrels can make their way into your Rockwall walls, attic, or crawlspace. These areas are warm places to hide out for the winter or a place to have their young to keep them safe. One squirrel alone can cause extensive amounts of damage. They can chew through electrical wiring, wood, tear down and shred insulation, and leave droppings everywhere. So, if you are dealing with more than one, the problem needs to be taken care of immediately. The best way and the most humane way that A All Animal Control of Rockwall has found to remove them is squirrel trapping. This keeps the animal from being harmed and it also protects the professional removing the animal. Squirrels; especially if they have babies with them, can become aggressive. In either circumstance, you just want the bats to be gone and the damage repaired. What A All Animal Control of Louisville will do is a complete bat removal. Then a sealing of the structure will begin and any cleaning can be initiated after everything is sealed out. Bat removal is a process that must be done in the proper order or the bat problem can be made worse. Bird problems range from birds in a dryer vent to roosting on the roof eaves; or even living in the attic. Sparrows, starlings and pigeons are the most common birds that we work with in Rockwall, but woodpeckers can also create damage to our clients homes and businesses. It is unhealthy to have a bird in your home or business as they carry mites, lice and diseases such as histoplasmosis. Bird nest material is a source of fuel for a fire. Dry grasses ignite easily and if they come in contact with electrical wiring, it could catch on fire and burn the house or building down. We have removed nests that were five feet deep in some cases and if those were to catch on fire, it would surely be out of control quickly. Skunks are notorious for digging around foundations, decks and sheds. They also fall into window wells as they do not have the greatest eyesight. A skunk is not something that you want living at your Rockwall home. They can set up a den site to have their young and are carriers of diseases such as rabies. Fleas and ticks are other things that skunks can bring home with them and they will give those to your pets as well. A All Animal Control of Rockwall is ready to help you with your skunk removal problem. We are just a phone call away from capturing and removing those skunks and improving your quality of life quickly. You don’t have to live with the smell either as when we remove them, the smell normally goes too. Our possum trapping experts are here to help remove opossum from your home, business or property. If opossums cannot find a tree or suitable hole to live in, they will gladly move into a chimney or an attic and even a crawlspace.